What makes these the World’s most expensive arancini? It’s not so much what’s inside, but the story behind them. Never let it be said that food blogging is easy or cheap! Arancini day in the Bibbyskitchen turned out to be quite the expensive kind. Truthfully, deep frying only ever happens when there’s a severe craving for either churros or arancini. And today, it’s the latter. Balancing on chairs while steading a camera is already challenging. Learning how to shuffle-walk on chairs is another skill that’ll stand you in good stead if you’re thinking of becoming a food blogger. Propping backboards against random objects is nothing new, although tugging the contraption closer for a better view, is. The final tally for 20 aranacini plus damages came in at around R2850.00 That’s about R142.50 per bite. I ate them slowly. Making risotto the night before is a good way to get ahead with arancini prep. We eat half for supper, keeping the remainder aside. The following day it’s more of an assembly job. When making the risotto, feel free to add your favourite herbs, dried being better than fresh in this instance. Swap out the chorizo for pan-fried pancetta, if you prefer. I’m using a spicy chorizo sausage. For a vegetarian option, leave out the chorizo and replace with rehydrated porcini mushrooms. They’re meaty and delicious. Risotto Milanese is traditionally made with saffron and served with Osso Buco. 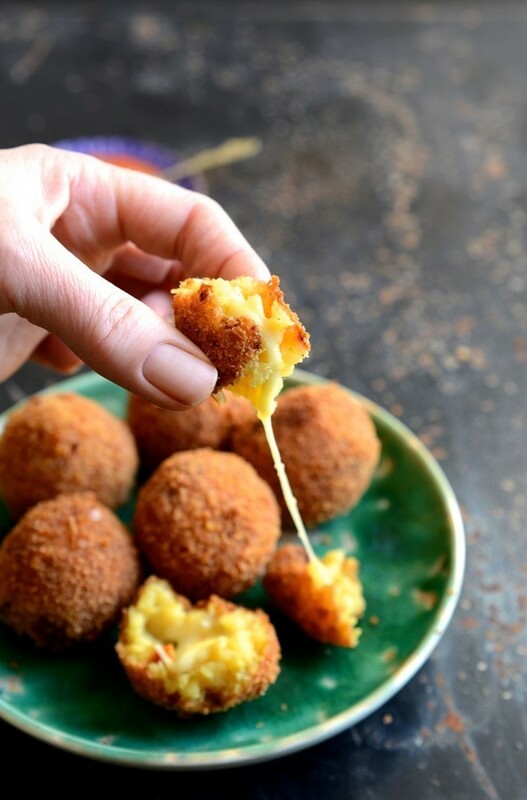 It also makes the perfect base for these stuffed arancini. Do go sparingly with the saffron though. It can easily overwhelm. In addition to the parmesan in the risotto, the centre is stuffed with mozzarella. It turns molten when fried, as one expects from a good stretchy cheese. 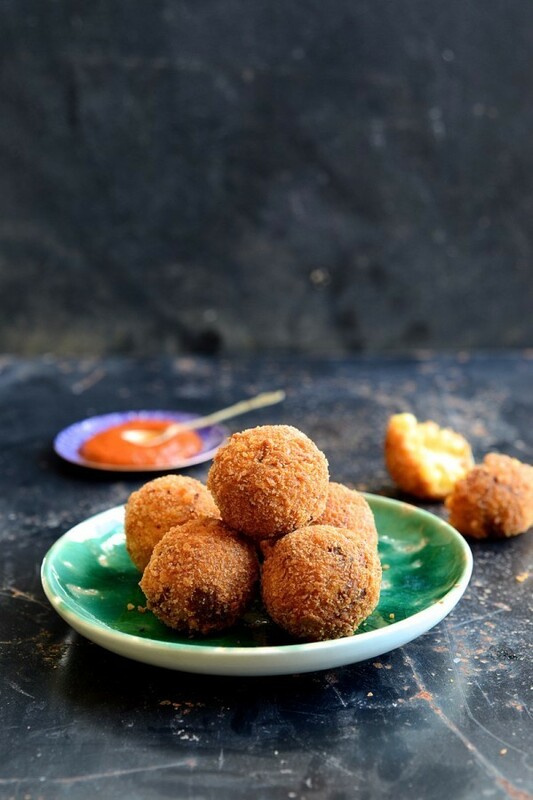 For extra crunch, I coat the arancini in panko breadcrumbs. Heat the olive oil and butter in a saucepan. Add the chorizo and cook for several minutes until the red oils. Remove and set aside. Pour the stock into a separate saucepan, add the saffron threads and place on the heat to keep warm. Add the shallots to the pan and sauté until softened. Add the leeks, thyme and lemon zest and cook for a further 2 minutes. Add the rice and stir to coat in the buttery oils. Toast for about a minute. Now add the hot chicken stock, one ladle at a time allowing the rice to absorb the stock before adding the next ladle. Stir continuously to agitate the rice. Add the chorizo, parmesan and 2 tablespoons butter to the risotto. Season with black pepper. Transfer to a bowl and allow to cool completely. Cover and refrigerate overnight. For the arancini, combine the breadcrumbs and panko crumbs. Place the eggs, flour and crumbs into three separate bowls. Roll tablespoon amounts of risotto into balls. Press slightly to flatten, then place a piece of mozzarella in the centre. Close and roll into a ball. Repeat until you’ve used all the risotto mixture. 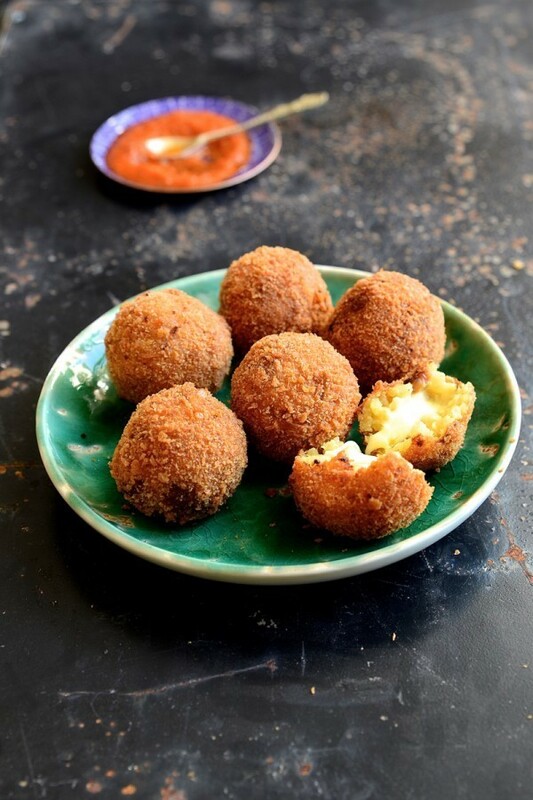 In a deep saucepan, heat the oil to 180º C.
Dredge the arancini in flour. Dip in the egg, then in the breadcrumbs. Place gently in the oil and cook for about 3-4 minutes or until golden. Turn over and cook for another 3 minutes. Oooh these look so delectable Di! Thank you. 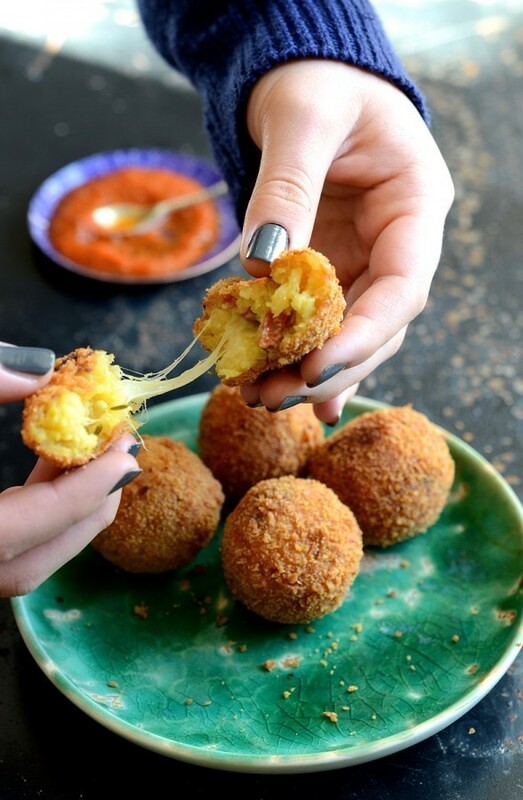 They do take a little effort Marie, but there’s nothing quite like biting into these crunchy arancini. Every thing has its price,but without the photographic encouragement I may not have attempted this scrunchy mouthwatering temptation !Will wear protective armour this time.Have not forgotten the vetkoek episode !! A very lucky escape! I might leave the vetkoek up to those in the know.